It’s officially fall: Sweet Potato and Cauliflower Curry. After a glorious, glorious DC summer, the weather is starting to get cool. While I’m sure I’ll take this back in the coming weeks/months, it’s actually exciting to get back to cooking with some hearty vegetables and to making stews. It’s been a couple of late nights at the office for the husband and me, so I’m looking to keep it light, healthy and nutritious tonight. 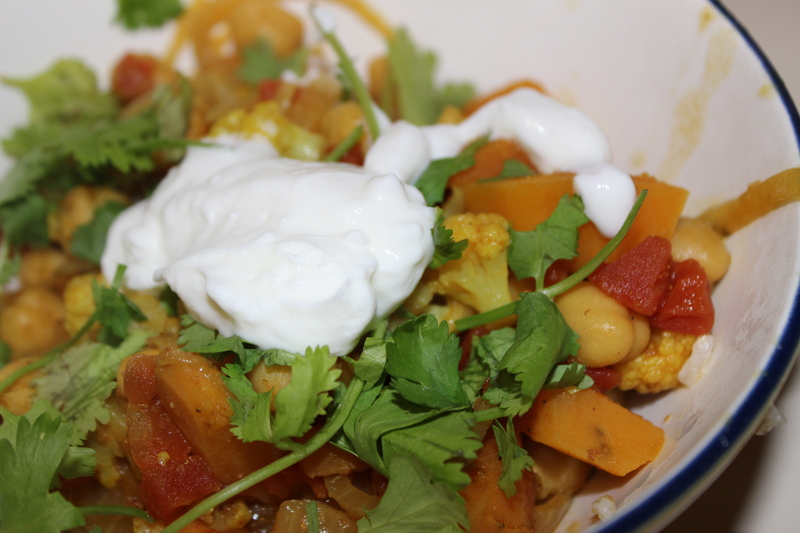 I’m testing a new recipe for vegetable curry – making some tweaks along the way, of course. If you’re using basmati rice, get it started according to the package directions. It will take quite a bit longer than the rest of the dish! Heat olive oil in a large skillet over medium-high heat. Add the sweet potato and cook 3-5 minutes. Reduce the heat; add the cauliflower, onion, and curry powder; add a dash of red wine if you like. Mix everything together for about a minute. Add broth, salt, chickpeas, crushed red pepper and tomatoes; bring to a boil. Give everything a good mix, reduce heat, cover and cook about 15 minutes (should be just about the right time to serve with the rice!). Serve with yogurt, cilantro, whatever you like. Yum! Surprisingly developed flavors for such a quick meal, and it’s (healthy) comfort in a bowl. Definitely worth another go…maybe next time, with naan? Posted on October 3, 2014 October 6, 2014 Author varinajCategories vegetarianTags cooking light, curry1 Comment on It’s officially fall: Sweet Potato and Cauliflower Curry.